Sony hasn't had the easiest time getting its well-designed smartphones into the hands of eager Americans. T-Mobile has already announced that it will add Xperia Z3 to its lineup, but other carriers have been silent on the Sony Mobile front—until now. Verizon will release the Z3 later this year, with a few extra tricks. This smartphone, named the Xperia Z3v, has a slightly tweaked design compared to the international Z3 we caught a glimpse of at IFA in September. The rounded aluminum siding is instead replaced with plastic with a strip of aluminum running along the edges. The design is actually more reminiscent of the old Z2. They also opted for angled edges instead of being completely round. It's a small but noticeable difference as the Z3 feels a little bit more comfortable to hold. Also Verizon once again goes branding crazy by slapping its logo on the top of the device, shifting the Sony logo to the bottom bezel, and also replaces the Sony logo on the glass-paneled backing. Except for the small trim difference and branding overload, everything is the same in the looks department. 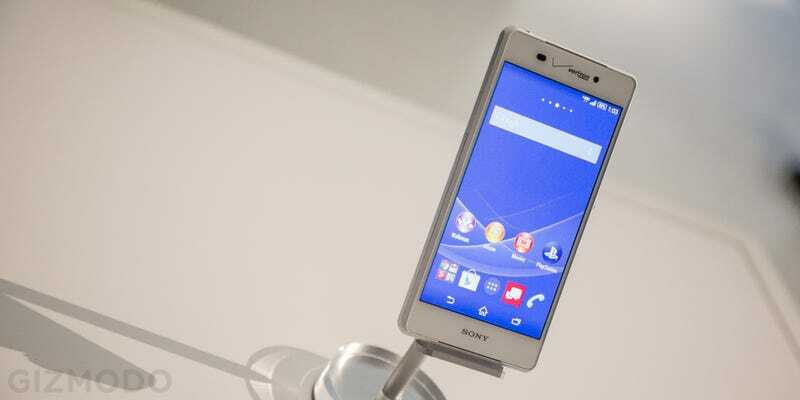 The Z3V comes with Sony's full HD Triluminous display and the same 5.2-inch form factor. However, the internals also see a little bit of tweaking. Other than supporting Verizon's CDMA radios, Sony also packed in Qi wireless charging that works with any charging pad that uses the standard. This is actually smart engineering as one of the annoyances of the Z line of smartphones have been fumbling with the tiny hinges that gives the handset its waterproof powers—but also a frustrating barrier when trying to charge. However, this new charging feature comes with just one sacrifice: actual battery life. A Sony rep told us that with the Z3 the company was confident saying that users could get two days of battery out of its 3,100 mAh battery. Even though the Z3v ups the battery storage to 3,200 mAh, Sony has changed its claims to "more than a day." Although this is still pretty admirable, it's obviously not as impressive as the device's original claims. Sony PlayStation entertainment also announced, or rather reiterated, that the Z3 series will be joining the PlayStation Vita and PlayStation TV as remote play-capable devices for the PS4. This integration will definitely help make the Z3 a pretty enticing choice for gamers. Overall, the new Z3 fit inside the old (in technology terms) Z2 body makes it feel like its a little behind, even though its specs suggest otherwise. Also its a disappointment that the Z3 compact is still MIA stateside. Sony is one of the few smartphone makers who've been able to shrink down their bigger flagships into smaller devices with sacrificing very little in terms of performance or user experience. We can only hope that a future U.S.-centric Xperia event is incoming. But if the Z3v happens to strike your fancy, you can pick up the handset for $200 starting October 23rd online and in Verizon stores.